Gabby S. Tiongson a.k.a. “DIKO” wields a Sharpie with the surgical precision of a scalpel. Black lines, sure and strong, cut through paper giving life to creations pulled from Tiongson’s cerebrum. Like a hyper-energetic Frankenstein, the 26-year-old concocts “design ideas” that graft together body parts—human, animal, and imaginary. His background in medicine has given him the confidence to toy with nature and the gall to replace a pig’s ears with human hands. 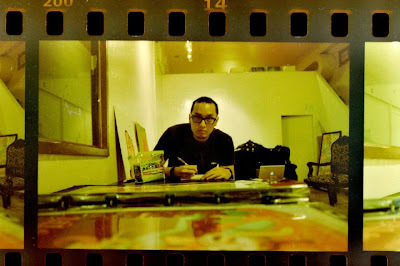 Tiongson’s cartoonish style is a culmination of all his influences and obsessions, among which he counts the animated television shows from the 1980s and 1990s; fantasy genre computer games such as World of Warcraft; Todd McFarlane’s Spawn; and legendary creatures such as the chupacabra. A wild talent used to producing at least one freehand work a day, Tiongson honed his drafting skills by participating in notebook “doodle battles,” creating vector graphics for T-shirts, and drawing structurally sound fingers based on Richard Snell’s Clinical Anatomy. Tiongson’s introduction to the Manila art scene comes in the form of Neurana, short for “neuroanatomy,” a solo show composed of pen-on-paper illustrations and experimental acrylic paintings. In his inaugural exhibition, Tiongson takes the brain, the seat of consciousness and intellect, and transmogrifies it into a giraffe, a whale, a snail, and many other visual puns. His hand is deliberate, his lines clean. Many of his drawings, which feature limbs in the most unusual places, are adorned with belly buttons, a reference perhaps to omphalokepsis, navel-gazing, and self-contemplation. To fill in white space, he uses indigenous patterns, the stylized Tinalak diagonals adding a subtle Filipino-ness to what is, at first glance, a very Western sensibility. Tiongson, a self-taught artist, is still feeling his way to his own style. Nevertheless, after filling many a sketchpad with his imaginings, he has developed a cohesive body of work marked by a recognizable aesthetic. The smooth, expressive contours of reality-flouting subjects radiate a confidence built over years of drawing. Even without being formally trained, Tiongson is in possession of his own visual vocabulary. Gabby Tiongson’s 1st One Man Show dubbed as “Neurana” opens August 26 2011, 6pm at the Vinyl On Vinyl Gallery at The Collective, 7274 Malugay street, Makati.